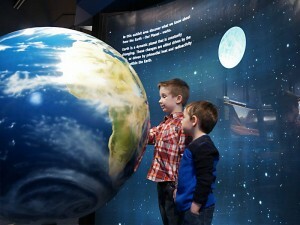 The Johnson GEO CENTRE, one of Canada’s most unique Science Centres, has been designed to suit everyone’s timetable and interests. To fully appreciate the many GEO displays and exhibits, as well as The Titanic Story and the ExxonMobil Oil and Gas Gallery, we recommend you set aside 2–3 hours. You’ll find that there is more than enough to see! However, if you’re in a rush, you can still enjoy a quick visit to the GEO CENTRE in under an hour. Ask our friendly staff as you enter for tips on how to move through quickly without missing any of the most popular points of interest. The GEO CENTRE is wheelchair accessible and offers free, off-street parking. Bus parking also available. Still want to know more about what to expect? Check out a more detailed description and photos of what to see. Not sure how to get here? We’ll show you the best route from anywhere! And be sure to also review our admission and hours of operation. Whatever your time frame, no matter what your interests, you’ll find an experience you will always remember at the Johnson GEO CENTRE!